The Library Bureau and its predecessors were the first significant providers of library supplies and "fittings" for America's libraries. 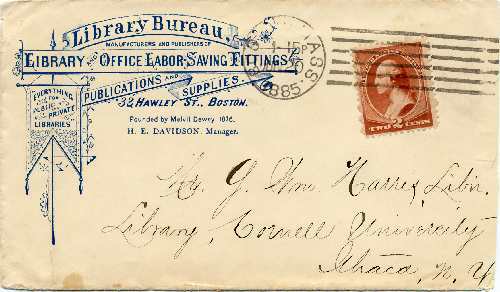 Although this envelope, mailed in 1885 to the Librarian of Cornell University, indicates that the Library Bureau was founded by Melvil Dewey in 1876, it was not legally established under that name until 1881. Melvil Dewey initially sold library supplies through the American Metric Bureau which he established in Boston in 1876. On June 30, 1877, the library supply component of the American Metric Association became the "Supply Department" of the Library Cooperation Committee of the American Library Association. In March 1879, Dewey moved the Supply Department out of ALA and created a new company with the name Readers and Writers Economy Company. Financial and management difficulties led to the demise of the Economy Company in 1881. Dewey then founded a new library supply business under the name Library Bureau. In 1886, the Library Bureau was once again facing financial and management difficulties and it underwent a further reorganization. (Source: Irrepressible Reformer by Wayne A. Wiegand, American Library Association, 1996). 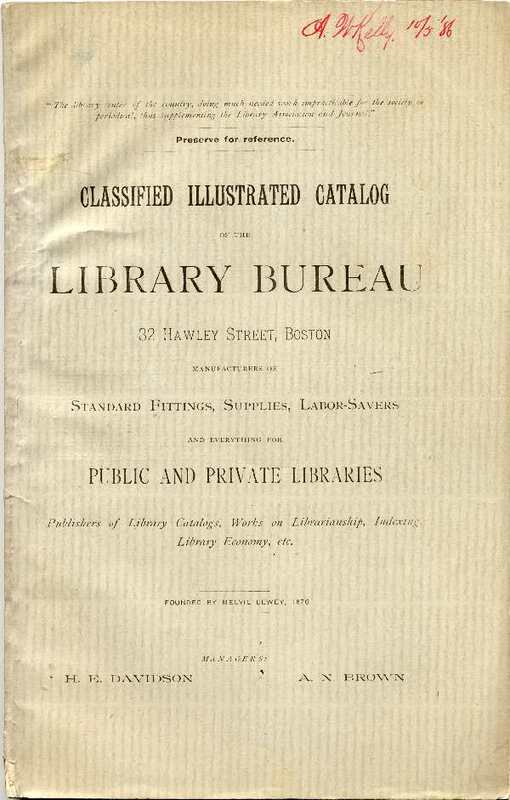 This is a catalog for the Library Bureau for the year 1886, ten years after Melvil Dewey's began selling library supplies through the American Metric Bureau. Click on the thumbnail image to see a larger image of the catalog cover. 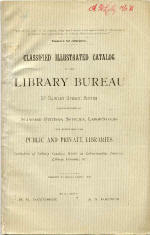 In a paper on "Fixtures, furniture, and fittings" presented at the World's Library Congress held at the Columbian Exposition of 1893, Henry J. Carr, Director of the Scranton (PA) Public Library, had this to say about the Library Bureau catalog: "With no intent to advertise, but rather for convenient reference and brevity in the present paper, as well as for aid to seekers, no hesitation is felt in citing the ample and comprehensive illustrated catalog of the Library Bureau as being both an available and very desirable guide in fitting up a library." 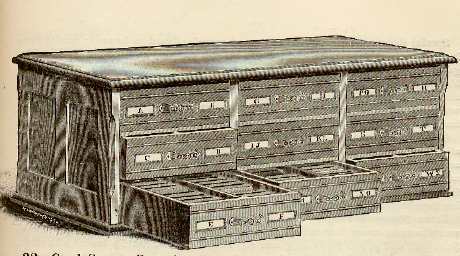 Among the items illustrated in the 1886 Library Bureau catalog is this early card catalog cabinet. It is designed to hold standard 7.5 x 12.5 cm catalog cards but unlike later catalog cabinets each drawer is divided into two rows. Click here to find out more about the evolution of the card catalog. The Hammond Card Cataloger was described in the catalog as "Preeminently the library typewriter, and the only one thus far invented that writes catalog cards perfectly." 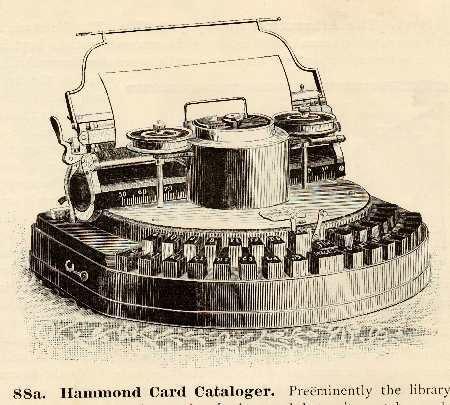 In an 1892-93 survey of cataloging methods of the 191 libraries that responded, 40 reported the Hammond machine in use and all but 8 found it satisfactory. This model of the Danner Revolving Bookcase is one of several marketed by Library Bureau and illustrated in their 1886 catalog. Click on the thumbnail image to see a larger image of the bookcase. 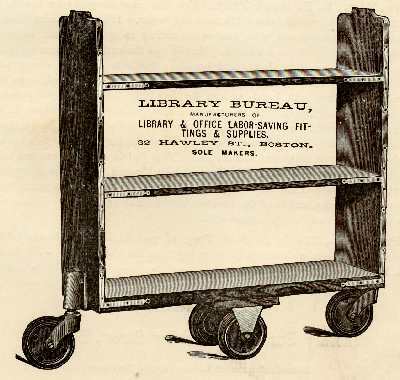 This Library Bureau book truck is described in their 1886 catalog as "The most useful single device ever made for an activ library." 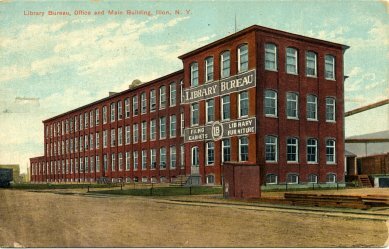 A postcard mailed in 1911showing the Library Bureau's Office and Main Building in Ilion, NY.